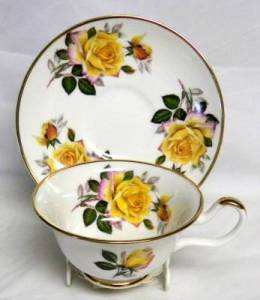 Lovely yellow roses with a hint of pink on the petals on this bone china cup and saucer set by Sheltonian. This cup and saucer is not microwave oven safe since they are trimmed in gold. Yellow roses have a meaning of joy, gladness and friendship. What a simply lovely gift for a best friend.